Well. The last time I disappeared from my blog I reappeared with a baby. No baby this time, but I do have news: I have a new job. After nearly six years at Boston University, I packed up my things and said goodbye to Kenmore Square. Tomorrow morning is my first day at The Perkins School for the Blind, just over the river from us in Watertown. And no more development research; I’m trying my hand at stewardship. The easiest way to explain it is that I will be writing donors to tell them how their gifts are being used. There will also be some proposal writing and research drawing on my past job. But anyhow, my job search explains my absence. I spent a good portion of this past month applying, interviewing and submitting writing samples, and I’m excited that I ended up at such a great place and so close to home and daycare for Lilli. I’m sorry I was gone for so long, but if there was a month to disappear in, March is really the one to skip. Nothing really grows in March, and we’ve reached the end of cabbage and kale. 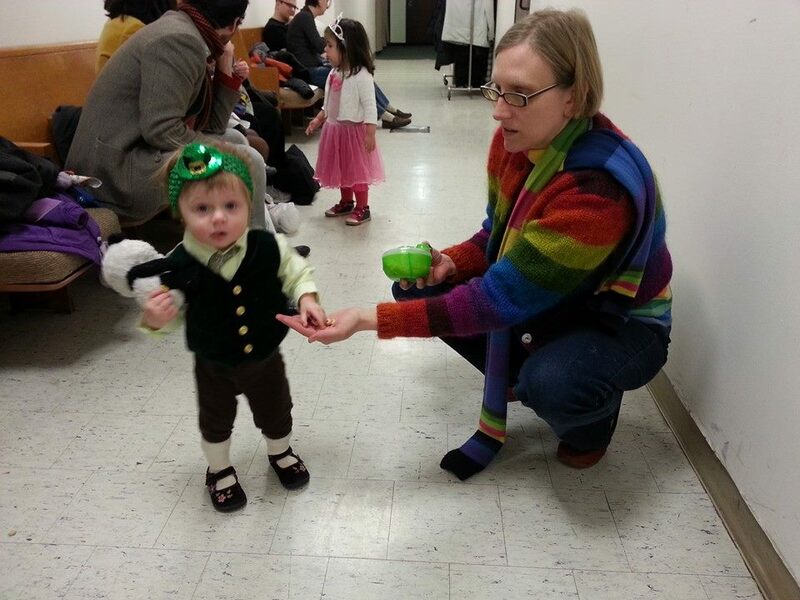 Honestly, the only thing you missed was Lilli dressed as a Leprechaun for Purim this year. Now it’s practically April, which means asparagus and ramps and fiddlehead ferns. My new job is about a mile from Russo’s, which should mean there’s now time to shop for produce after work before I pick up Lilli at daycare. And while leaving BU means no more Ward’s Berry Farm CSA, we’ve already signed up for a new one at Red Fire Farm which starts in early June. I’m sorry for disappearing, but I’m so happy to be back. Have a great first day tomorrow! I used to do red fire farm, they were great! I had no idea of your connection but I’m so happy you shared it. Thank you for that. Everything I’ve heard about Perkins has impressed me. I’m delighted to work here. Congrats on the new job, and welcome back!! Congrats! Perkins is such an amazing place. The proximity to Russo’s is also a major bonus. Can’t wait to see what you cook up after all your shopping trips.